This is for those that are interested in reading my natural birth story of Jonah Noel. It’s pretty long, so be prepared. It’s also written to Jonah 🙂 Just wanted to at least put it up somewhere so I don’t lose it! It was an AMAZING, but hard experience that I wouldn’t take back for ANYTHING! I am so PUMPED and BLESSED & feel like such a SUPER MOM – and it’s all because of Him!! 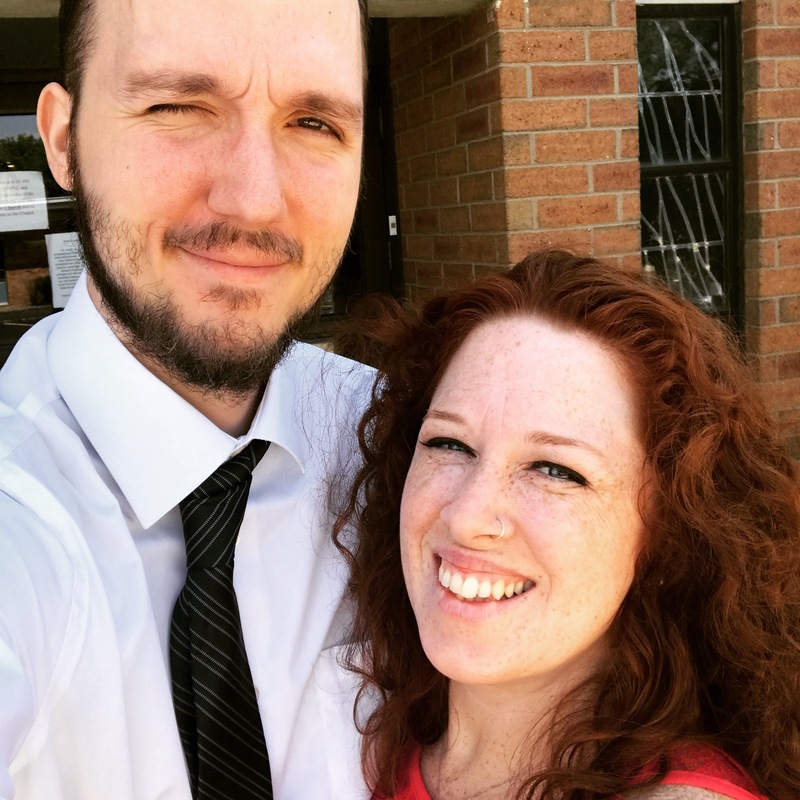 He got me through it – God is AMAZING!! Me with my sweet baby Jonah. “This is story of my baby Jonah’s birth. On July 11th I went to my regular OB appointment for you. Actually, it wasn’t a “regular” appointment since they had been monitoring me for Pre-eclampsia, but none-the-less I went in for the usual check-up. My BP definitely was high, so I just kept my cuff on for the whole appointment rechecking and rechecking. Kimary was the midwife that saw me that day. She had been trying to get my lab work from Quest with the latest 24-hour urine test that I did (that way we could see the numbers to get an idea of what to do). In any case, she suggested the option of induction. I told her that I wouldn’t mind doing it; especially for the safety of my baby (you) and myself. So when it was all said and done, I was scheduled to come into the hospital that night at 8PM and be induced. Brian captured this board a couple days before Jonah was actually born. 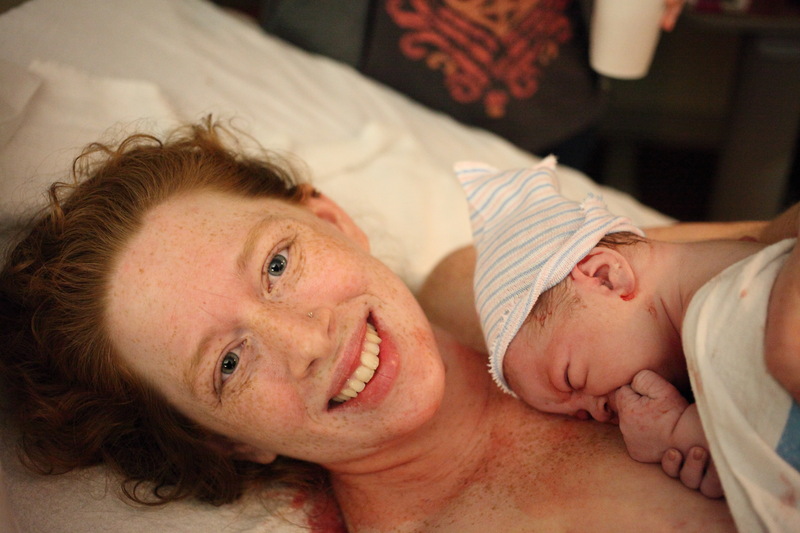 I wasn’t really into the whole induction thing – since I really wanted to go more natural with a water birth – and not force you out. But I also didn’t want anything to happen to either of us, so there really wasn’t much of a choice. And Quest still hadn’t gotten back to Intown about my labs. So I went home from the appointment and just prepared for that night. I believe I took a nap (or was just lazy), and then when your daddy was home we started packing things up. It was crazy. Surreal. I was about to see my baby by this weekend (that’s what Kimary said – by Saturday). After we packed everything up, we headed to Atlanta Medical Center and checked in. They had NO rooms – everything was full. We ended up going to the waiting area and hung out there until about 11PM (when they said our room was ready). While in the waiting area we met another couple – they weren’t in labor but she was having contractions. We also were entertained by Hell’s Kitchen (with cuss words every two-seconds) as well as Full House. It was random. That night Anjili was on-call. She came into the waiting room before they took us back and was discussing the induction stuff. Our doula Ashley had suggested we ask about the Foley Bulb – so it was funny when Anjili suggested it. Basically what is was was a catheter that is place up through an opening in the cervix (at that time I had a very posterior cervix and I wasn’t dilated but by less than a cm or something), and then they fill the balloon on the end of it with saline (water). So basically the idea was that the weight of the balloon on my cervix acts like the “baby’s head” in order to open the cervix up. It’s a more natural way of induction. This is what the Foley Bulb looked like. Eek! Anjili told me that she was an “expert” at putting these in, and I trusted her. That turned out to be exactly the truth. This hurt sooo bad going in! It gave me the worse cramps and pain that I had felt, but I tried to relax and endure it. The nurse on-call that night was Keia, she was so sweet. She helped and assisted Anjili while she put this in. Once it was in place it gave some cramping, and then we were on our way to seeing you! That night I experience some pretty heavy cramps/contractions. They were pretty bad. Your daddy was there all the way with me, sleeping on a rather uncomfortable couch and eating countless snacks and drinking Gatorade. He actually did end up finishing that Gatorade – and it was either a 64 ounce or 128 ounce. He said he wasn’t going to have Gatorade for a while. Me, shortly after we were put in our room at AMC. The next day Anjili came and pulled the foley bulb out. That whole night it was making me have bloody show – and I made your daddy clean it up. It was crazy. When Anjili took that thing out she said to “relax”. Man, that was hard. She tugged a little and I could tell it was going to come out, but man. Yea, that hurt. So basically the foley bulb took me to 4cm (they considered a foley four). That morning we also had Dr. Bootstaylor come into the room to check on us. I was pretty much out of it since they had given me some different sleeping medicines the night before in order to help me sleep. Oh, I mustn’t forget our wonderful nurse Mimi that came on after Keia had run her shift. Mimi was our favorite. She was a Korean girl that was married to a pastor that pastored a Chinese-American non-denominational church. She was sooo sweet! After they had inserted and taken out foley bulb (on Friday), they started me on a low does of pitocin. They basically were trying to mimic “natural” labor as closely as they could. So they started at 2 units and went up from there. I pretty much ended my stint with Pitocin at about 12 units. This was the wonderful “peanut” that our nurse Mimi gave to me! While the foley bulb really gave me hard contractions, the pitocin didn’t. On shift change came Julie and another midwife-in-training named Carrie on-call. 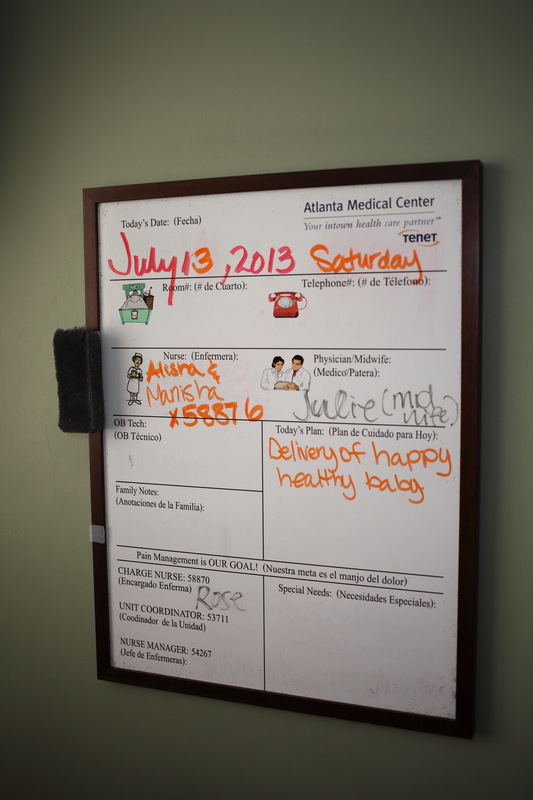 We also had a shift-change with nurses and got a really sweet nurse named Alisha (that was in-training under another woman; with which we couldn’t really understand her name on the board). We ended up getting checked and there really wasn’t much change dilation-wise. However, she did point out that I had a bulging bag of waters right where your head was, so she had suggested we could break my waters and see what happened. At that point we were only at 4cm and 60% effaced. And to be honest, I was a little scared about breaking my water. I think in the back of my mind I knew it was going to progress things a lot faster and harder, and the only really bad contractions I had had were with the foley bulb. Your daddy and I discussed this for a while, called Nonni, Grandma, Ashley & Erin and then requested to talk with Dr. Bootstaylor. We were given the option (before talking to the Dr.) that we could either go home or do it. I felt so much immense pressure about it – and since being there for so long, had just wanted to get it over with and see you. It just seemed like a waste to just go home, but the more we talked with our support system the more I thought that it was better to go home. We were both so exhausted (and the hospital beds sucked). After talking to my Mom about breaking my water. I was scared. So on Saturday morning/afternoon, Dr. Bootstaylor called the room. Your daddy answered it while I was in the shower cleaning up, and he agreed for us to go home. We also agreed to another 24-hour urine and to make an appointment to see him again on the 15th or 16th of July (after those results were turned in). So we left and went home. Your daddy ran to the store and bought some tasty dinner (chicken from Publix and turkey for grinders), so we ate and hung out with your Aunt Lissa that night – until she went to church. I also started to have my own contractions at the house. Now these were a little more painful and would make me stop in my tracks. By that night we weren’t having any more signs, so we went to bed and slept for a straight 12 hours! I believe this was after a nice hot shower & when we were told we were able to go home! By the next day, things definitely kicked into high-gear! 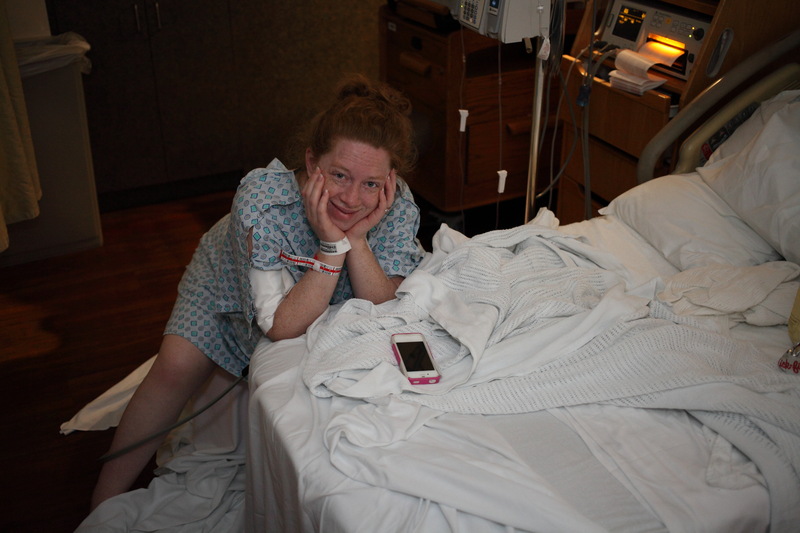 I started getting regular contractions that were very painful. Your daddy downloaded an app to keep track of them and they were anywhere from 1-2 to 4-6 minutes long. They were just so crazy! While talking to Ashley, she suggested I get into a tub and labor in there to see if it slowed things down. Even though it felt pretty decent at first, it didn’t let up. I ended up getting out after a while (since I felt so hot), and just labor while walking around the bedroom. I do believe I got back into the tub, and your daddy had fixed wash cloths in a small bowl of ice water in order to help me with the hotness of the tub. It just seemed like I couldn’t get into any positions that would help. I tried the breathing techniques (deep breathing) and sometimes it helped and then a lot of times the contractions were so painful that all I could do was cry. I kept saying that I couldn’t do it – but your daddy was getting mad at me and said “no, you can do this”. So I tried to stay as positive as I could and started to say that ..even though I was so doubtful since the pain was so bad! The other neat thing that I did while in the tub was start speaking in tongues. Your daddy and I started doing that and it seemed like it helped. There were just no words to describe how I felt, and it was such a bonding moment between us that I felt really helped me get through some of the hard stuff. After a while we decided that I needed more support, so we had Ashley go ahead and head over. At that point, all modesty was pretty much out of the window. I had a small towel on since coming from the bath, but yea ..I was pretty much naked from here on out. Or as Ashley liked to say “Nekked”. There was just no let-up between these contractions I was having and finally (as I had been telling your daddy for a while) we called the midwife. Kimary was actually the mid-wife on-call so she told us to head into the hospital. She listened to me work through contractions over the phone. I have to say that the hardest part of that day ..was driving to the hospital. I think I had a small break in-between contractions at home in order for us to pack up. But it wasn’t that much. Brian and Ashley packed up things and I proceeded to the car and right as I as in the entrance to the garage I had to stop and have a contraction. Ashley did mention that she thought that once I made the decision to go to the hospital that things seemed to slow down. I don’t know, maybe it was a mental thing too. I knew that she knew what I wanted. I wanted a natural birth. I just know once I started talking epidurals and saying I couldn’t do it that Ashley was starting to get into her doula-mode. 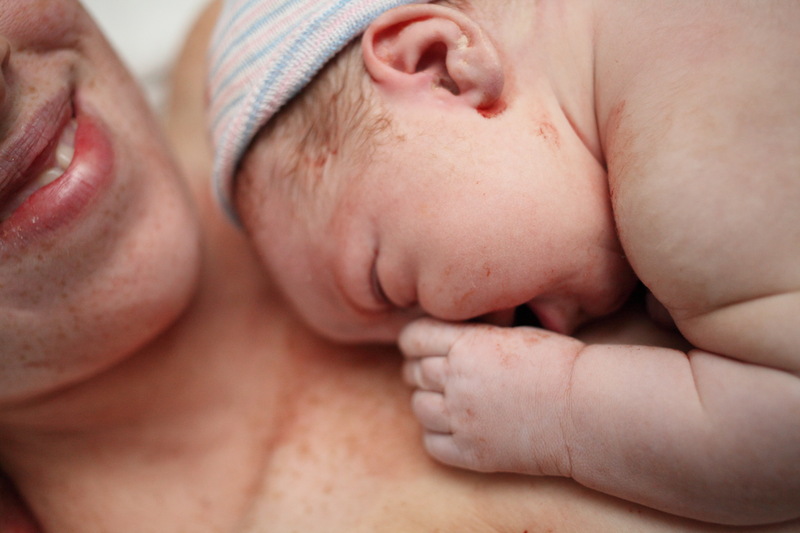 I didn’t want an epidural and I didn’t want a c-section. All I know is that these hurt, so I wanted to go to the hospital. On our way driving (man, your daddy was a crazy driver) I kept having contractions. It was hard because the car seat base was in the middle of the car, and I was on one side and Ashley on the other. At one point I was down leaning against the back of the front seat. Ashley just kept putting counter pressure on my back. That’s really what I had liked. And I just kept trying to do deep breathing – all while driving down I-75 into Atlanta. 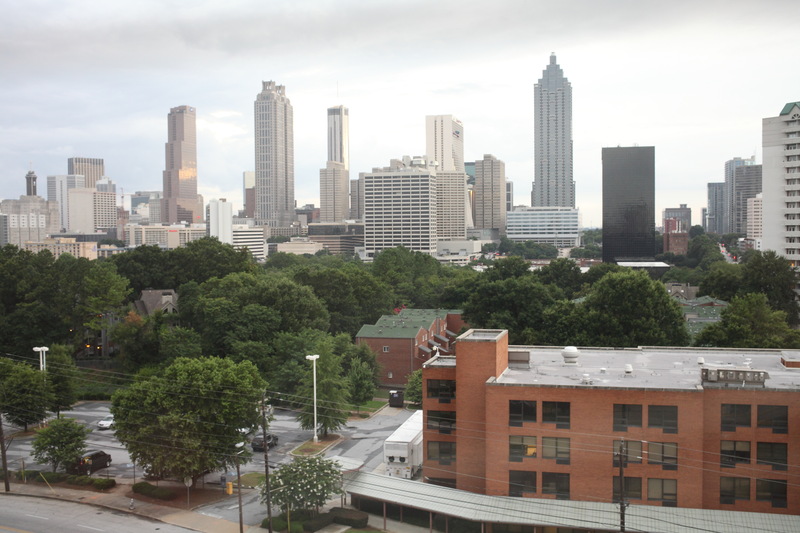 Our Mother/Baby Unit recovery room view – the skyline of Atlanta. When we got to the light at Jimmy Carter/Freedom Parkway things were starting to get on my nerves. The light took forever. Who put a light there? Especially with stinking pregnant people! I remember yelling at the taxi cab in front of us to GO ..since they were taking forever. It was crazy! Once we got to the hospital, Brian parked the car while Ashley and I got out. I ended up having a contraction right then as we were in-between getting out of the car and going into the hospital. I also ended up getting them walking in. I was just walking really slow. Luckily when she pressed the elevator button a door opened right up. We got into the elevator and I started to just do laps inside while it took us to Level 7 – Labor & Delivery. When we got there we went right in and some of the nurses looked at us funny. It was Keia! She thought that we were in the Mother/Baby Unit already, but I told her that we had left the day before since nothing was happening. In any case, the nurses needed me to check in. I couldn’t even write my name – so I had Ashley fill it out for me while I yelled out the answers. A nurse came by and started walking me back to LDR #9 – where they proceeded to monitor me for 30 minutes. Those 30 minutes were the longest of my life. It felt good just standing up and doing it versus sitting down, but it was insane. So Kimary came in and informed us that we could possibly do a water birth I was excited. She suggested that we first jump in the shower and try stuff like that to help with the contractions. She had checked me as well – and I was 6cm 100% effaced at that time. So I jumped in the shower (at this point, and from the house – I was completely naked ..and didn’t care). So I jumped in the shower and then I asked your daddy to come in the shower with me. He didn’t know where his swim suit was, and thought it was still in the car, but then realized that he could just wear his gym shorts sans undies, so he came in and helped me in the shower. The hot water felt good, but the contractions were super strong. Your daddy helped by using counter pressure on my back while I had the contractions. It really did help. 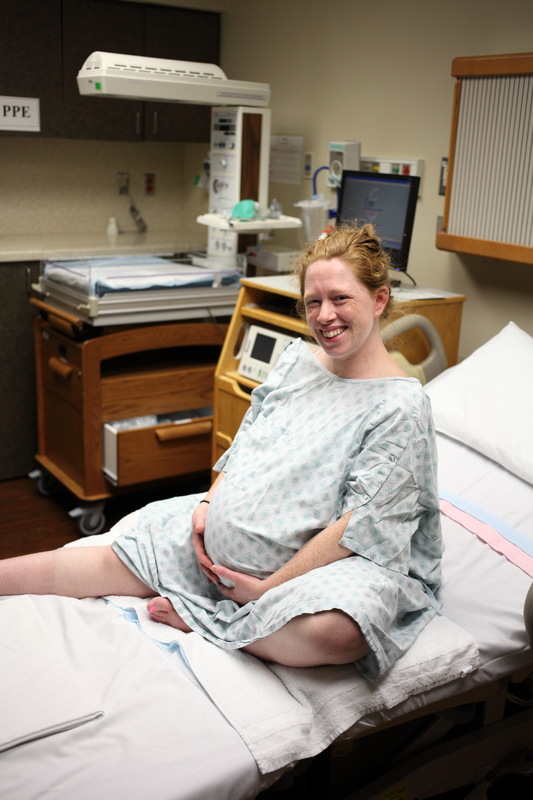 It was just so hard making it through these contractions – I thought that I couldn’t do it. I really couldn’t help but feel that way since they hurt so bad. We stayed in the shower for a while, with the hot water running down, but then the water started to become too much so I shut it off. To make matters worse, the water was pretty jacked up, and I think they had to jerry-rig something in order for it to work in the first place. Not only did Brian help me in the shower, but he traded off with Ashley – and she came in the shower (when the water was turned off of course) and helped to put counter pressure on my back. I know when I was having these contractions Ashley kept telling me to take advantage of the breaks, but there weren’t any breaks. That’s what made it difficult. I didn’t want to move, change positions or anything because frankly I couldn’t. It was just that intense. I did end up getting out of shower and making my way into the L&D room and sitting on the ball for a while and up against the window as well. It was just hard to get into any position that felt good. The contractions were really strong. Shortly after you were placed on my chest. While I was in the shower though, they were using the doppler to check on the baby, but I guess it started to get a little harder to hear your heart tones, so they eventually hooked me up to the monitors to to keep an eye on you. Your heart rate would drop, go back up and then go to a good heart rate. Your dad said it was probably (and I agree) because of the contractions being so close together. I just had no time to breath and relax; giving you that time to relax as well. Like I said, it was intense. While I was being monitored, Kimary told me that I probably needed to empty my bladder. I hadn’t gone to the bathroom. So they put a bed pan/pad below me on the floor and I tried my best to pee in it. I could feel I had to go, but I just couldn’t. Thinking this was causing the delay in progression, Kimary decided to do a catheter and drain the urine out. Your dad still can’t believe they fit that catheter in me. All I know is that it was fairly uncomfortable, but it worked. I think they drained like 150 units of urine out. I don’t think that it was much to change anything, but it was something. When Kimary checked me again she did mentioned the bulging bag of waters again. She thought that if she were to break my water then it would progress you more. So, being 6cm and 100% effaced still, I told her go ahead. I had been scared of having it done, but I was ready to see you – and I wanted to progress more. I just thought if I didn’t do anything, then it would just go on and on and on. I mean there’s nothing wrong with that, but after being at that hospital pretty much all weekend, and a few days before, I was ready to see you. So Kimary broke my water, and I felt a little gush – not too much. I think it was because most of the fluid was up behind you – and that’s what Julie had said. It was just a little fluid in front of your head. Even your dad said that it didn’t seem like too much when she broke it. And it didn’t really hurt either – I was so afraid of it hurting. I’m not sure why, since it was your bag of waters. It wasn’t like it was a part of my body that they were rupturing. 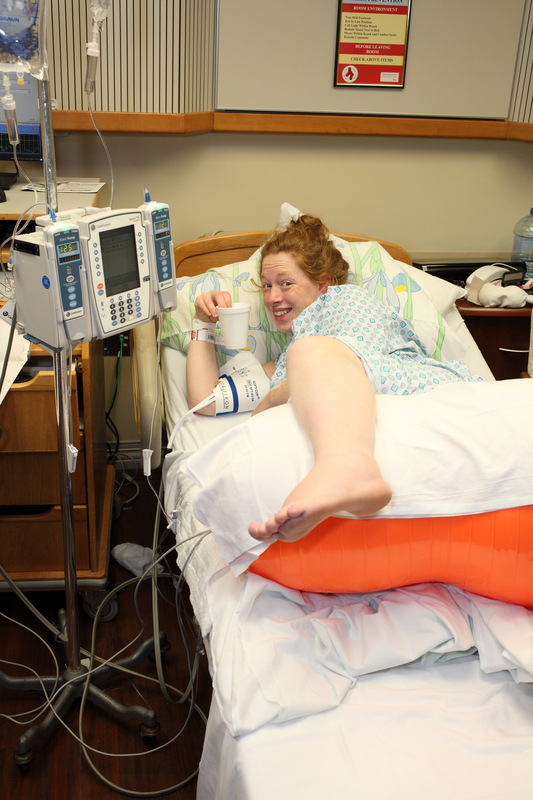 I did go from -2 station to -1 station – and went from 6cm to 7cm dilated in just breaking the water. So things carried on with contractions, but the girls became more concerned with the heart rate than anything. I also couldn’t get into any good positions to get comfortable, but hands and knees worked pretty good. 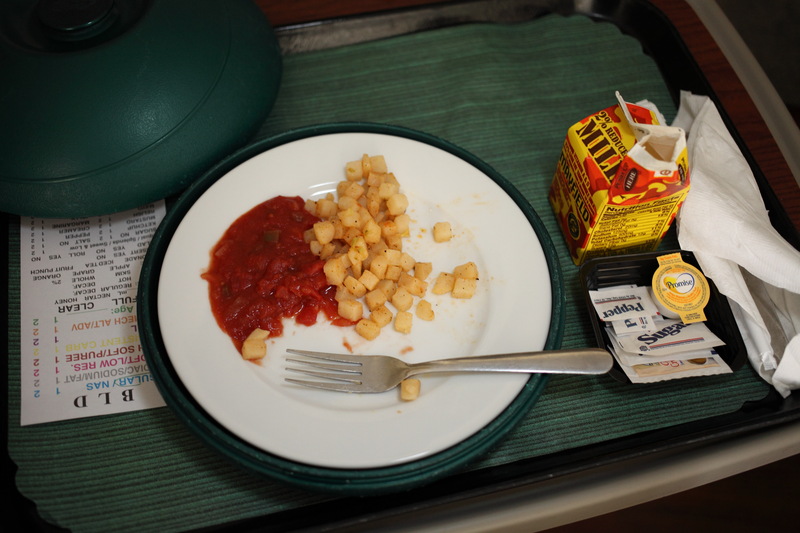 There was a point of when I was turning around on the bed and switching positions that I totally screwed up my IV and it fell out of my hand – blood splurting everywhere. That was classic. It even got on your dad. I swear they stuck me with like 100 needles/IVs during my stay. It was crazy. So that definitely was a challenge to them since they wanted to keep me pumped with fluids, etc. Eventually I got into the position of standing up on the bed and leaning over the head of the bed. That felt like a comfortable position. Since your heart rate was crazy, things started to get serious – so they put me on an oxygen mask, and I tried to calm down. I knew that if I was freaking out then it wouldn’t help you. And I noticed that after a while things would look better with your heart tones, and Kimary was happy about that. Because your heart tones were all over the place, Kimary decided to put a fetal heart rate monitor on top of your head in order to get a better reading. Your dad said it was because they wanted to compare and see if what they were getting on the outside was about the same on the inside. Because of the scare with your heart rate, Kimary soon enlisted the help of Dr. Bootstaylor. I also go to the point of wanting to quit. I was so tired, hurting – and just didn’t know if I could take the pain anymore. I told Kimary that I just wanted an epidural or a c-section. It was just too much. She said that she had called Dr. B in and he was coming, and I had asked her and she said he was a few minutes away. So while I was naked, leaning over the head of the bed, Dr. Bootstaylor came in. I felt him rub my back to reassure me that he was there, and then the man took over. He wanted to check me, but I just couldn’t move from my position – so he said, okay I’ll check you from here. So what he did was basically try and stretch out my cervix more manually. I think after Dr. Bootstaylor stretched my cervix out more you went from -1 station to +2 and I was pretty much on a road to having you. I was lucky with my condition – and the condition that you were in – that they allowed me to have a vaginally birth. I think any other practice would’ve had me get a c-section. Not Dr. Bootstaylor. I think he was determined to give me the most natural childbirth that I could have. And I pretty much had one – since I didn’t have an epidural. I still can’t believe all of the stuff I went through without pain meds. I really do believe in your body’s natural ability to withstand pain. It was crazy. The Blessed family of 3! ← Wow. This is Different. I Like It. Exactly! Jesus is AMAZING!!! Thank you for the compliment!